IMG_7649, originally uploaded by Mic2006. In pursuit of the slurping sound I waded onward down the watery tunnel. The water was about 5 feet deep, clear and greenish tinged. Remarkably the floor was composed of pea gravel – tiny little rocks worn smooth and translucent by the running water. I wondered where the pebbles had come from – I am in a dolostone terrain and some of those pebbles were igneous in origin. IMG_7647, originally uploaded by Mic2006. You would be surprised how cold ground water can be in August. While exploring an Ontario cave I heard this strange hollow bonking sound, it was really loud, a sort of chugging, slurping gong. It kind of freaked me out until I realized that it came from somewhere along this water filled tunnel that I am backing down – water pumping up against a low ceiling, a one way trip down into the sump. P1010606, originally uploaded by Mic2006. If you want it you can find it at the Bancroft Gemboree. 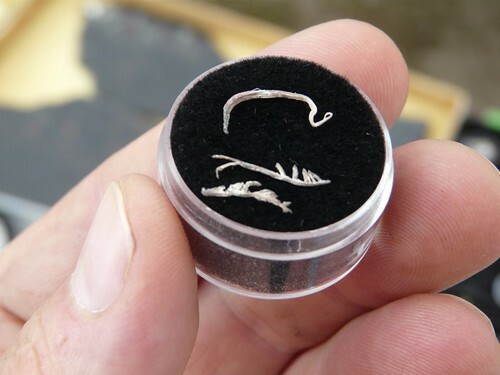 Yeah – they look like fletched arrow spines, barbs on fish hooks or just poorly made hooks but as the vendor explained, they are naturally occuring pieces of silver wire. I am especially interested in what can be found up in cobalt. There was a massive silver strike up there in the early 1900s. According to the fellow that I was speaking to he said he had no luck in Cobalt – shook his head like it had been a really distasteful experience. “Got these from California”. I suspect he was keeping me clear of a rich hunting ground. These pieces of silver wire are sometimes found in tangled balls and at other times in thick strands like the branches of a dead tree. Pink Buddhas a hot commodity at the Bancroft Gemboree? P1010580, originally uploaded by Mic2006. This lady was selling pink buddhas at the Bancroft Gemboree. I have just got back from spending the weekend there and I have taken a number of interesting photos of the people and the minerals that were being sold. This was the first person that I saw as I walked in. P1010706, originally uploaded by Mic2006. 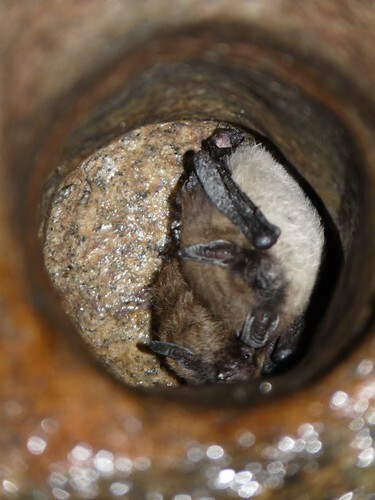 Much has been said of the mysterious disease that had been killing bats this spring. Having just seen numerous bats in Northern Ontario (Bancroft area) I was unable to notice any of the white fuzz around the nose. This disease might possibly have just shown itself earlier in the year – or maybe it has not hit the mines up around Bancroft. These bats are sheltering up at the end of a shallow drill hole and numerous other bats were flying around in the tunnels.